Is your fridge looking a bit plain? Why not liven it up with some of our superhero magnets here at Superheroes Direct? Decorate your refrigerator, or any metal surface, with characters from your favorite comics, movies, video games, and TV shows. Featuring logo magnets, mask and helmet magnets, and magnets featuring superheroes in classic action poses from both comics and films, choose from a variety of styles and heroes, such as Captain America, Daredevil, Deadpool, the Hulk, Spider-Man, Iron Man, Thor, Black Widow, and many more. An excellent, inexpensive gift for any comic book fan, our superhero magnets are a quick, easy way to bring a little superhero style to any kitchen. A masked figure lands with ease from what should have been a devastating fall. With inhuman reflex, he maintains his footing. 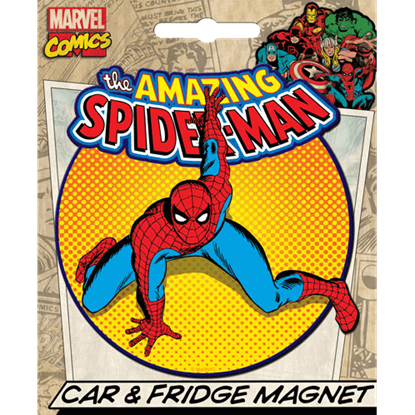 Enjoy the awesome comic book image of your favored web-slinging hero with the Amazing Spider-Man Magnet. Captain America is coming, and he has got a fist full of justice to serve you! This Captain America Hero Magnet embodies the hero from head to toe in a classic look that harkens back to his earlier comic book appearances. Captain America is a mighty superhero with the brave heart of an American soldier. Let his red, white, and blue emblem show your pride for both country and comics in magnificent display on your vehicle and other decorative spaces. 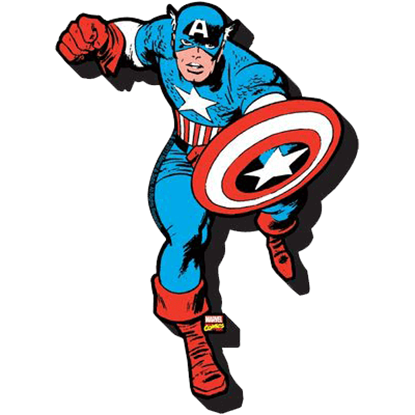 The single most iconic feature of Captain America is undoubtedly his shield. 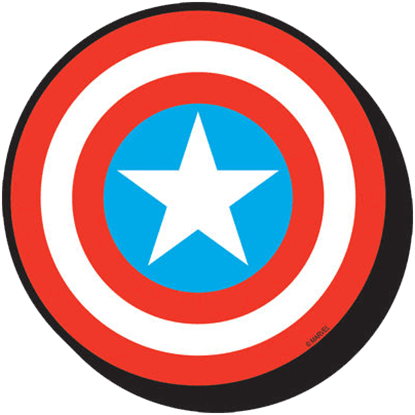 The Captain Americas Shield Magnet recreates its design so that you can display his shield wherever you live and benefit from its protective design. Lips curve into a bright, innocent smile. Voice lifts in joyful lilt as she gracefully dons the mantle of royal court jester. 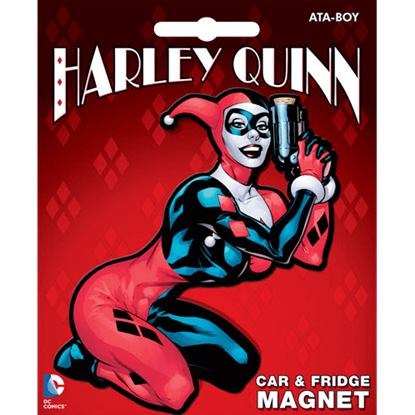 Do not be fooled by the festive attire of the trickster exhibited by the DC Comics Harley Quinn Magnet. Two mischievous, yet strangely cartoonish, eyes stare suspiciously at you from behind a misaligned not-allowed sign. 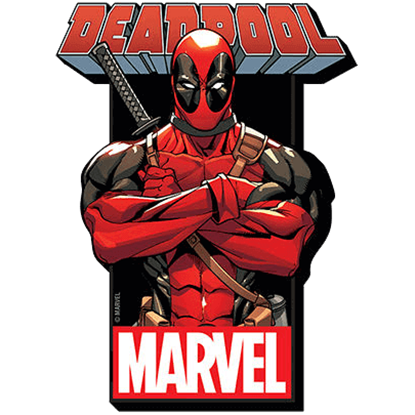 Admire the forbidden humor and odd behavior of the famous antihero with the Deadpool Emblem Magnet. Tell gravity that it can take a hike from your refrigerator with this Deadpool Logo Magnet! Display your love for the Merc with a Mouth and his iconic assassin costume anywhere metal is found with this fun and functional magnet. Who could be better than a highly-trained mercenary to keep your refrigerator and all of its contents safe from harm? 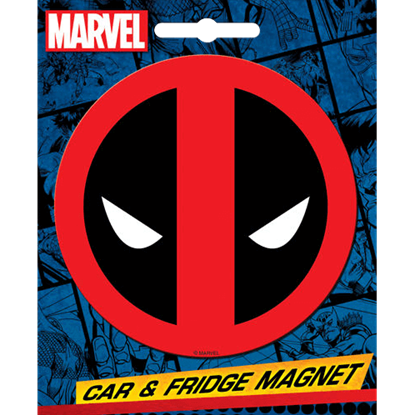 Stop those pesky snack-stealers dead in their tracks with this Deadpool Magnet right on the front of your fridge. The hit series Game of Thrones delivers a masterful world of fantasy and intrigue. 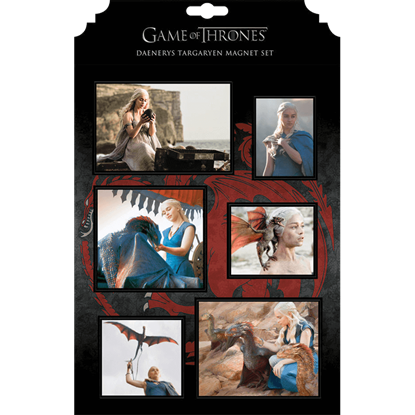 Show off scenes of your favorite dragon mistress with the six-piece Game of Thrones Daenerys Targaryen Magnet Set. The words, As High As Honor, serves as the motto of the Great House of Westeros that presides over The Eyrie. 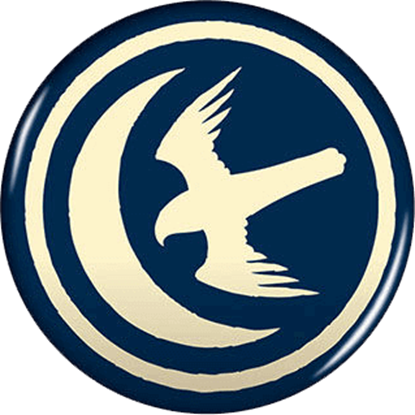 The sigil that appears on the Game of Thrones House Aryn Magnet proudly represents the Lord Paramount of the Vale.